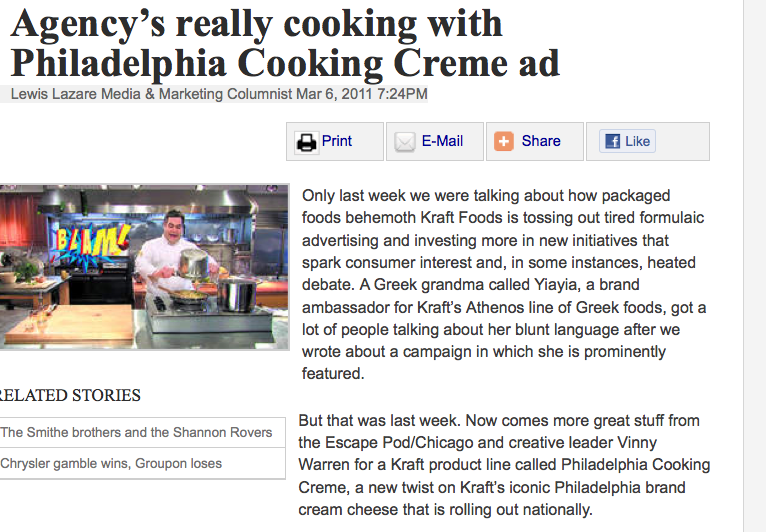 Premier Chicago ad columnist Lewis Lazare just reviewed our new work for client Philadelphia Cooking Creme. And we couldn’t be happier. 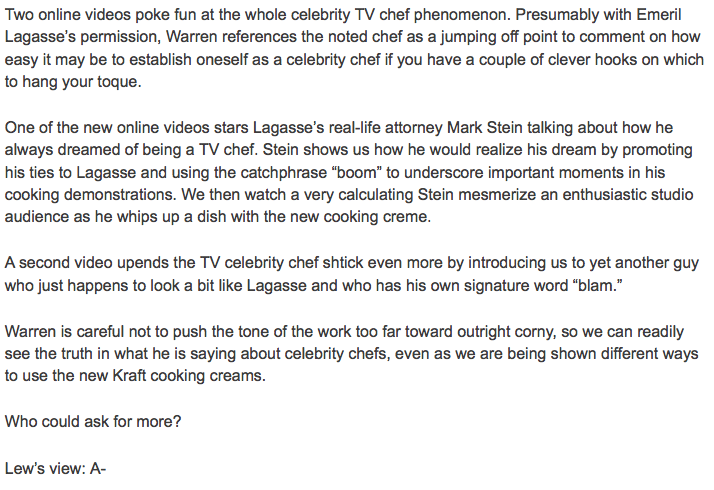 and you can see COOKING WITH EMERIL LAGASSE’S ATTORNEY HERE. AND COOKING WITH A GUY WHO LOOKS A BIT LIKE EMERIL LAGASSE HERE. The Escape Pod is number two! According to Chicago Sun-Times ad guru Lewis Lazare, our Penny Pranks campaign was the second best work to come out of the Midwest last year. Yay! And because we’re only number two, we will try harder this year. So look out Barrie D’Rozario et al! Just a week ago, we were talking about our concerns that 2009 might prove to be at least as difficult a year for the Chicago ad industry as 2008 was. Who knew that just hours later, a federal lawsuit would be unsealed alleging Leo Burnett/Chicago had inflated billing on the huge U.S. Army account over several years? It was a stunning revelation that Burnett quickly tried to put a damper on by announcing it had agreed to settle with the federal government and two whistleblower plaintiffs to the tune of more than $15 million. What a way to kick off the new year, eh? But this column isn’t about 2009. It’s all about acknowledging a few ads from Chicago-based ad agencies and companies that brightened our days over the course of 2008. Granted, it has become more difficult in recent years to find work coming out of Chicago that was better than merely acceptable. Clients nowadays are all about using advertising for short-term gains, so the big idea that used to be at the core of the ad business has all but vanished. And outstanding creativity along with it, we hasten to add. 1. “Sea Orchestra.” (Barrie, D’Rozario Murphy) Ad biz insiders will immediately know that this exquisitely detailed TV commercial didn’t come from a Chicago agency, but rather a boutique in Minneapolis. But it was executed on behalf of a longtime Chicago-based company, United Airlines. This is by no means the first time a United spot has topped our annual list of the year’s best ads, but when we first saw this commercial featuring a vast group of sea creatures performing United’s signature musical theme “Rhapsody in Blue,” we knew it would be tough to beat in 2008. In fact, we don’t recall seeing anything anywhere in the last year that came remotely close to matching the creative genius exhibited in this lush spot that brilliantly burnishes the United brand. 2. “Used Car.” (The Escape Pod) Creative honcho Vinny Warren, who had a productive career at DDB/Chicago, left that shop several years ago to open the Escape Pod. Freed from the corporate shackles of a declining DDB, Warren’s creativity seems to have flourished ever more impressively. A series of spots done for OfficeMax last summer include some of Warren’s best work. Shot on location in New York, each commercial showed what happened when attempts were made to purchase merchandise with only pennies. A spot featuring a car salesman with hysterically oily mannerisms was perhaps the best of a very good batch of work. 3. “Egg” (Leo Burnett) As if it didn’t have enough to deal with already, Burnett now has to grapple with the fallout from an internal billing scandal. But despite all the agency’s problems, there are a few creatives toiling at the shop who have demonstrated some creative savvy via outdoor work for longtime client McDonald’s. This big egg sign went up at a McDonald’s near Wrigley Field last summer and was cleverly designed to crack open each morning and then close up again as the lunch hour approached — all to remind passersby that breakfast was being served fresh and hot beneath those iconic golden arches. Nifty. 4. “Blue” (Euro RSCG) There’s no shortage of fashion advertising out there. But we find most of it to be cut — as it were — from the same cloth. Not to mention rather snooty and forgettable. Which is why we rather like Euro RSCG’s chicly unpretentious yet subtly amusing set of print ads for Brigid’s Bags, a local boutique vintage bag business run by Brigid Murphy, also known in show biz circles for her Milly’s Orchid Show. With a few deft copywriting strokes, this simple, uncluttered ad for a refurbished blue bowling bag suggests how the bag was of the moment more than 30 years ago in decidedly unchic Sheboygan and could be again today in Manhattan, where fashion is taken quite seriously in certain circles. 5. “Trust Fund Baby” (Cramer-Krasselt) In today’s ad world, the would-be humorists in too many creative departments tend to equate being funny with being crass and stupid. We long ago got our fill of that kind of stuff. So we are always eager to applaud work that comes at humor from a slightly more civilized angle. That is certainly how Cramer-Krasselt approached a campaign for Sealy mattresses that broke last year. A series of television commercials successfully poked fun at some very spoiled souls in our society who, because of their good fortune, never have to worry about getting enough sleep. The trust fund baby execution was our favorite, but the art direction on all of the commercials, coupled with some great voiceover work, made this very focused campaign pop. Your chance to own a piece of history. 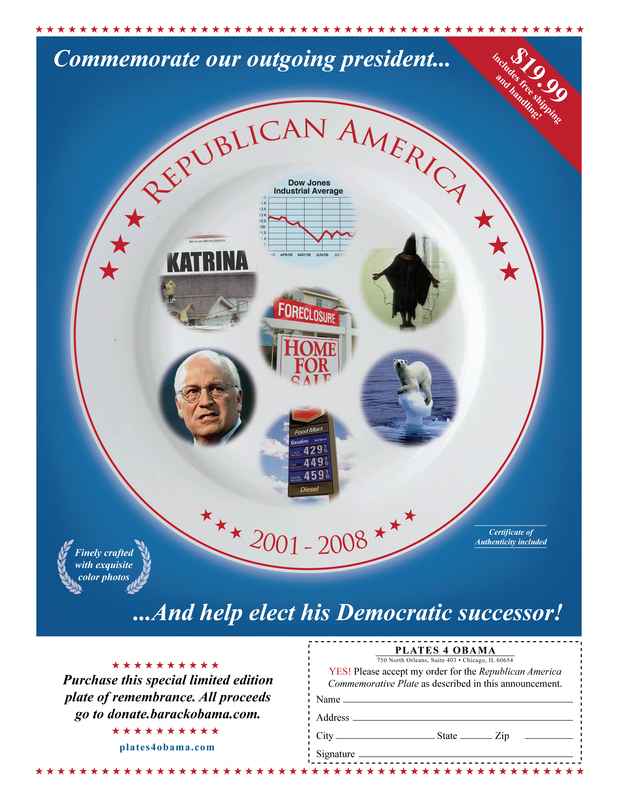 Our chance to get rid of our Obama plates. Back in August we, along with five other Chicago agencies, were challenged by our local ad columnist, Lewis Lazare, to come up with an ad for a Presidential candidate. And we did. The escape pod’s idea was to create something that would raise money for the Obama campaign. Alas, the Sun-times never saw fit to publish any of our ads as they’d promised. and so our efforts were largely for naught. we even created a website and all. we actually did sell some plates. and the money did go to the obama campaign. thank you adpulp.com and adfreak.com! net-net: we at the escape pod have some funny plates we need to get rid of. get one for the republican with a sense of humor in your life! Or, it’s the ideal holiday stocking stuffer for the long-suffering democrat in your life! Or, you just urgently need a plate! anyhoo, we’re giving these babies away as holiday gifts. from us to you. simply leave your name and address in the comments section and we’ll ship one off to you. why? because we love you. that’s why. Lewis Lazare, the Chicago Sun-Times ad columnist, asked The Escape Pod to participate in an interesting competition. It was this. 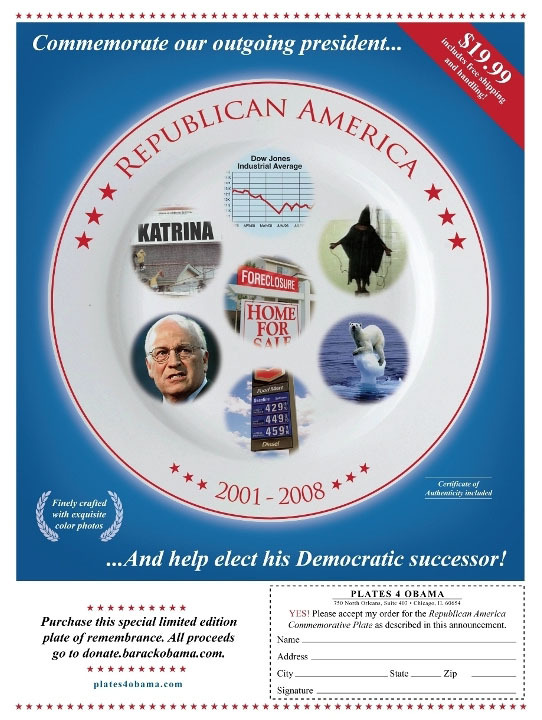 He asked us, along with several other Chicago ad agencies, to create a print ad for a presidential candidate. The kicker being that we would be randomly assigned the candidate we would promote. We had to agree to take part first. So we agreed. And we were ready to promote either candidate. We’re in advertising. We sell whatever we’re assigned to sell. That’s part of the fun. And we created the above ad. Our rationale was the following: people really vote against something rather than for something. And the Republican administration (both Bush and Mccain are Republicans) has been an undeniable disaster on several fronts. The economy being the most recent disaster. So we figured that’s something we should leverage. Encourage people to vote against a third Republican administration. Just as we would have leveraged John McCain’s experience, war heroism, and guy-you’d-like-to-have-a-beer-with-ism had we drawn the assignment to sell his candidacy. And we would have railed against Obama’s lack of experience. Mr. Lazare’s idea is to put the ads online and have the Chicago ad community vote on which one they think is the most effective. Now urging you to vote for our entry would be wrong from an ethical perspective. We posted our latest OfficeMax work to youtube last week and already we’ve gotten quite a reaction from both the media and the public. 800,000 hits on youtube thus far (We did a one-day youtube roadblock yesterday and are doing another tomorrow). And we got also got a bunch of positive reviews. Some were solicited by us and/or OfficeMax. Happily, most weren’t. 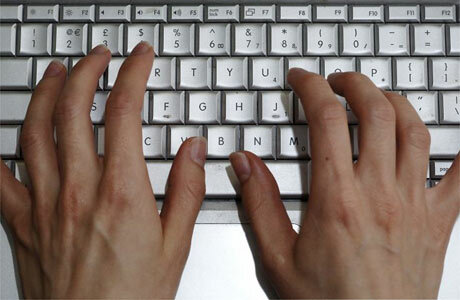 Lewis Lazare, ad columnist for the Chicago Sun-Times, laughed hard at our efforts. In a good way! The notoriously snarky and hard-to-please guys at Gawker.com were effusive in their praise. And the cool and funky cats at Contagious magazine wrote a piece on the campaign. I believe they’re putting our work on their next dvd. (Memo to self: subscribe to Contagious). But, for me anyway, one of the coolest reactions has been from the commenters on youtube. youtube can be a double-edged sword. it’s a big audience but it’s a very tough and vocal crowd. and not one that’s not typically hospitable towards advertising. And our stuff is very obviously advertising. There’s no mystery. No complex experiential game involving plastic gnomes with GPS in their hats. It’s retail advertising. COMMENTER 1: WAKE UP PEOPLE. These are not pranks, these are COMMERCIALS. Lame, lame, lame commercials. Those are actual comments btw. It’s almost touching in its own uniquely youtubian way.